As I drove to McCloud Nature Park in North Salem, Ind., flat land gave way to gently rolling hills, but that didn&apos;t matter to my 12-year-old son. His nose was stuck in his Apple iPod Touch. Park Naturalist Joe Reagin greeted us at the Nature Center and began to show us around the grounds of the 232-acre park. I asked him about his philosophy of the park&apos;s offerings. "We try to introduce people to the outdoors and healthier ways of living," Reagin told me. "We want to show them greener living. "Mostly, we want to get kids off the computer and electronic devices, and to come enjoy and discover nature." 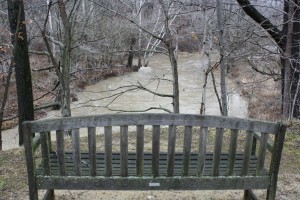 If my son was any indication, McCloud Nature Park is doing wonders acquainting Hendricks County youth with the outdoors. Once he started looking around, he couldn&apos;t get enough. 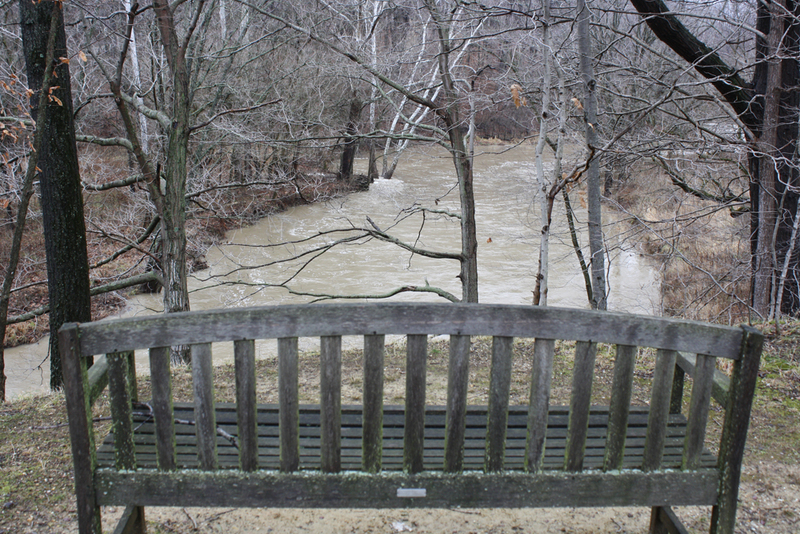 We were blown away by the breathtaking scenery, including the 70-foot-wide Big Walnut Creek, which meanders through the heart of the park. Hugged by glacial ridges, the creek also features exposed rock outcroppings, some of the very few in the northern half of the state. 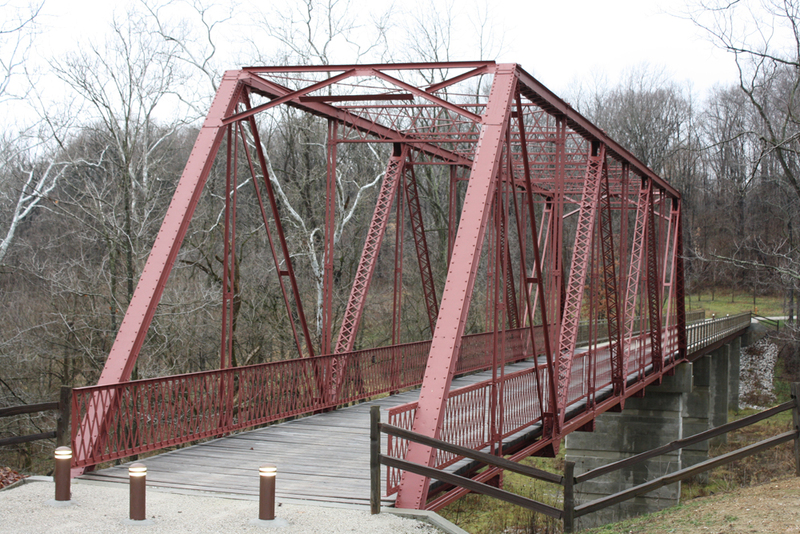 Majestically spanning the gushing creek is the restored 1913 historic Warren-through Truss Bridge. Transplanted from Pulaski County, where it crossed Big Monon Ditch, the 120-foot-span bridge is elevated 10 feet above the 100-year flood stage. 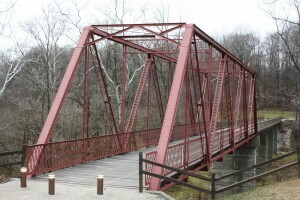 Painted in bright red last year, the bridge features a 4-inch oak floor, from where visitors can see all kinds of trails. We embarked on the 1.1-mile Red-Tailed Ridge, just one of 13 nature trails that encompass 6.5 miles. Reagin pointed out evidence of deer, red foxes and coyotes. Soon, we walked uphill to one of the three overlooks, where we relaxed on a picnic table and soaked in the clear blue sky, bright sun, hawks, prairie, grasslands, reforestation areas, open lawn space and ravine. We were at one with nature. Sometimes nature is cruel. McCloud burns its prairie every two to three years to limit invasive plants. My son&apos;s ears perked up to all this knowledge. He was being educated -- in the most natural way. To that end, McCloud offers a diverse range of programs, from those serving private groups (scout badges) to recreational (snowshoeing and cross country skiing during winter; fishing, canoeing in kayaking during warmer months) to weekly nature happenings. The next month features a whitetail deer hike, a class on how to carve walking sticks and Maple Syrup Days. The Hendricks County Park & Recreation Foundation&apos;s Pancake Breakfast runs the same mornings as Maple Syrup Days, where partakers change the sap from the park&apos;s maple trees into the sugary treat. On our way back to the Nature Center, we came across a 1930s-era storage house that once served as the original cabin when the park was private. Nearby, a butterfly garden patiently waited for signs of spring. The garden must wait; Old Man Winter hasn&apos;t lost his grip yet. More winter-related nature activities at McCloud will entice us between now and then. As a result, so will fewer electronic-device activities.